Before starting colouring work such as Ink and Paint or even creating new colour models, you may want to load existing colour palettes to your scene. You can do so by linking colour palettes to your palette lists. You may encounter a case where only a colour palette is visible when a layer is selected. If you need that palette in a second layer, you can link the palette to the second layer's palette list, A good example would be a scene where there is a character on one layer and its arm is on another. In order for both layers to access the palette, you must link both Element Palette lists to that palette. If you palette is linked to the Scene Palette list, it will be accessible by all layers. If you created a palette in another project and you want to import it in your current project, you can browse for the palette file on your computer and add it to your scene. When the palette is imported in your scene, the file is copied in the project’s directory. It is not linked to the original file. Harmony lets you link an external palette to your scene without copying it in your project. This method is not recommended. It is always safer to have the palettes contained within the database to avoid data loss if the source palette were to be deleted or the project exported without including the external palettes. You will notice that when you create or link a palette, a small icon appears on its left. These icons represent the palette linkage status. Indicates that the palette is safe. There won’t be any trouble once the scene will be exported. 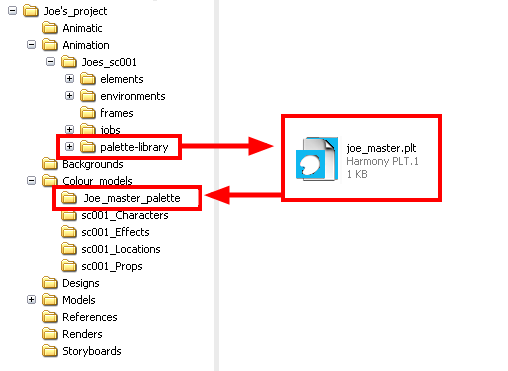 For example, the palette file is stored in the scene folder and is linked to the Scene Palette List. Indicates that the palette file is stored in a directory external to the scene’s structure. The palette file is probably stored in a Master Palette directory on a hard drive external to the palette-libraries planned for the palette storage. The warning in this case is that if you move your Master Palette directory to another location, you may loose the palette in your scene. Indicates that a palette file stored in a level such as Element, Scene, Job or Environment is linked to a Palette list that is not on the same level. For example, a palette file is stored into the Environment folder and is linked to the Element Palette list. The palette is shared. Indicates a potentially dangerous situation. Problems may occur when trying to export or link to the palette file. 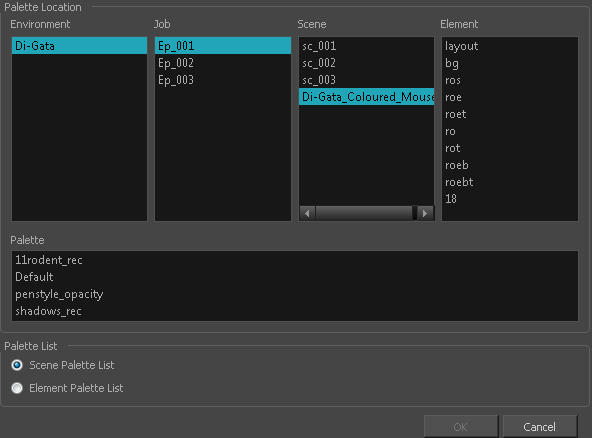 For example, a palette file is stored into the element folder and is linked to the Scene Palette list. The issue in this case is that if you decide to delete the layer containing the palette, you will loose it from your scene. ‣ From the Colour View menu, select Palettes > Link. ‣ Right-click and select Link. ‣ Click the Import button. 2. Select the level where the palette file is stored—see Palette File Storage . 3. Select the palette list linking level by enabling either Scene Palette List or Element Palette List—see Palette Lists. The palette appears in the Colour view. ‣ From the Colour View menu, select Palettes > Import. ‣ Right-click and select Import. 5. Browse for a palette file located (*.plt) on your hard drive. You will generally find the palettes in your project's palette-library directory. 7. If you are in Advanced Palette mode, select the level where the palette file is stored—see Palette File Storage . 8. If you are in Advanced Palette mode, select the palette list linking level by enabling either Scene Palette List or Element Palette List—see Palette Lists. 9. In the New Palette Name, name the imported palette. The palette appears in the Colour view and the file is copied in your project. 1. In the Colour view, click on the Create Palette button to create your palette to be used as external. 2. Save your scene by selecting File > Save from the top menu or by clicking the Save button or press Ctrl + S (Windows/Linux) or ⌘ + S (Mac OS X). 3. On your computer or server, create a master directory. Ideally, this should be created in your Root folder to keep it within the project directory. You could also place it inside your Colour Model’s subdirectory. Refer to the Fundamentals Guide to learn more about project organization. 4. 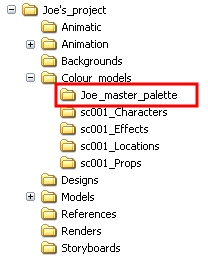 Name the folder appropriately, for example: Joe_master_palette. 5. From your operating system, browse to your Toon Boom Harmony scene and open the palette-library folder. 6. Select and copy your palette *.plt file to copy it to the master palette directory. 7. Create a new Toon Boom Harmony scene or open the scene where you will link this palette. 8. In the Timeline or Xsheet view, select the element to link the palette to. 9. From the Colour View menu, select Palettes > Link to External. The Link to External Palette dialog box opens. 10. 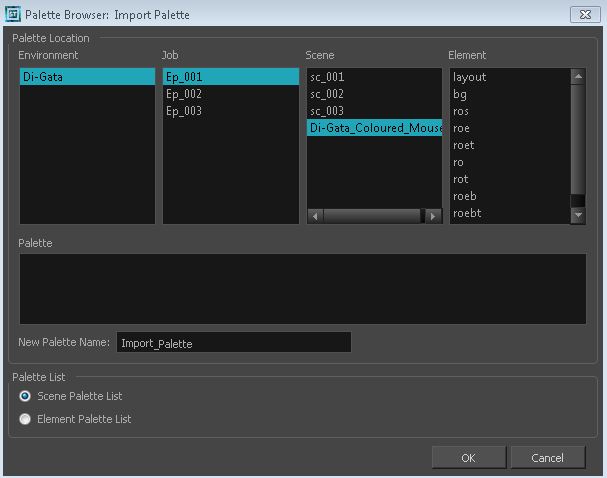 Click Browse to search for your master palettes folder and select the palette *.plt file you want to link. 11. In the Palette list section, select how you want to load the palette; at the scene or element level. The linked palette appears in the Colour view. If a palette is outside the scene, the External icon appears beside the palette name. 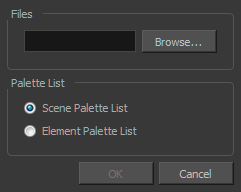 To link an element (such as a colour model) to the palette that is stored in the external palette directory, you must remove the original palette from the element’s palette list. You will then load the duplicated palette into the palette list using the Link to External command, like you did for the other elements.